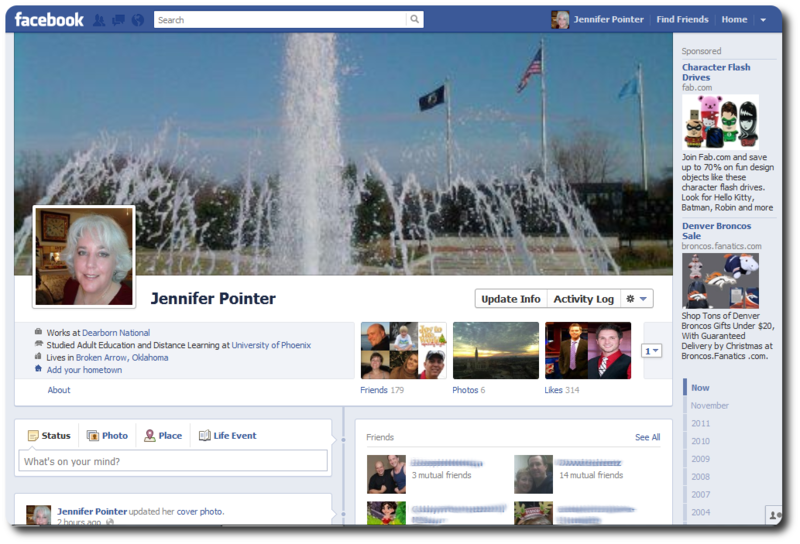 Facebook Timeline - well done! Facebook has a new profile format, and it has been advertising it for some time as a way to present the details of your life from birth. Considering Facebook's history of "updates" resulting in outrageous privacy violations, I was naturally suspicious. But I've downloaded the update, and have to admit I really like it. First, I like the fact that Facebook gives users a chance to preview the new look for up to seven days before publishing it. This gives us time to review what people will actually be able to see, including things we may have forgotten about because they're so far down in our history. The security settings for who is able to see what do not change from the old look to the new. I also like the fact that some of the fields have been updated, particularly the education field, which now gives users a chance to more clearly list which schools they have attended for how long and whether or not they graduated. Finally, the new look is more like a web page with a header, and I suspect it will replace a lot of occasionally-updated blogs. Nearly every field is customizable (or deletable), and you have total control over who can see it (in a very user-friendly manner). The "from birth" claim about the page is kind of funny, considering that the minimum age of a Facebook user is supposed to be 13, and Facebook hasn't been around that long. Unless you choose to start uploading all of your childhood photos (or your mother and grandmother discover Facebook and start tagging you in all of their family photos), you really won't have a history that goes back to birth. Your history will normally start when you signed up for Facebook, with a few entries relating to your high school or college days. Considering, however, that people do often post their children's photos on Facebook, it is conceivable that if the site hangs around for another decade or two, someone could literally have their whole lives on Facebook. What an interesting thought. A little frightening, but interesting. Anyway, here's a video to learn more about the timeline. To download it, go HERE. It's also available on mobile (you'll need to manually update your application, or uninstall and reinstall it to get it).